This is week 2 of the Summer Fun Quilt Along, and we have some pinwheels and beach balls to make today! I’ve heard from so many of you that are joining me in this quilt along and I’m so glad! 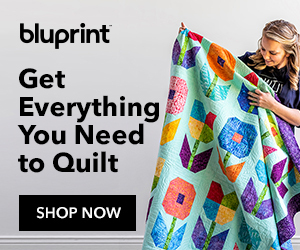 Even if you’re not making this happy summer quilt, it’s worth reading the instructions because I have some great tips for you that can be applied to many techniques. We’re not just creating, we’re honing our skills, too! All seams are made with 1/4″ seam allowance. Marking tool for fabric (I love Pilot FriXion Pens for this, but pencil or chalk pencil are fine too). Note: We will be making the pinwheels oversized and using the 8-at-a-time method of making HST’s. Draw a diagonal line in both directions on the white 6″ squares. You can also draw cutting lines that will bisect the square horizontally and vertically (see photo below). 2. Place a marked 6″ white square, right sides together, with a 6″ aqua square. Stitch 1/4″ on each side of the diagonal lines. Cut apart on the center diagonal lines and then cut the square in half vertically and horizontally (use the 3″ line on the ruler). TIP: If you don’t have a 1/4″ presser foot, draw the 1/4″ stitching lines and sew on those. 3. This will make 8 half-square triangle units. Repeat for the remaining 6″ squares of aqua and white for a total of 16 HST’s. 4. Press towards the aqua fabric. 5. Trim these units to 2 1/2″ square using a square ruler. I like to trim all four sides, but if you have two sides that are perfectly aligned, then you can trim just two sides. Place the diagonal line of the ruler on the seam. Make sure there is enough fabric to trim on the other two sides (if needed). In other words, they should be beyond the 2 1/2″ lines of the ruler. Trim the side and top edges. Rotate the unit half a turn and line up the previously cut edges with the 2 1/2″ lines of the ruler and the diagonal line on the seam. Trim the remaining two sides. 6. Arrange the HST units into a pinwheel as shown below. Sew them into pairs, making sure to nest and pin the diagonal seams. Press towards the darker side. 7. Sew the two pairs together to form the pinwheel block. TIP: The center of the pinwheel has four diagonal seams that need to line up in the middle. To achieve this, I like to use a “setting pin”. Nest your seams together and starting on the top seam allowance, you should see an “x” where the stitching lines are. Place your pin straight down through the “x” (if you turn it over, you should be able to see the accuracy of the pin position) and then straight down into the bottom seam allowance’s “x”. Leave that pin straight up and down (perpendicular) to the seam. Then pin on either side of your setting pin, close to the seam allowance. Remove the setting pin and sew your seam, making sure your stitching goes through the middle of the “x”. Check for accuracy. It should look like this once it’s pressed. 8. Pressing: The center of the pinwheel block can be very bulky. This is a great time to “twirl” the center seams. Do this by pressing one half of the seam allowance up and the other half down. You may have to coax the stitches to release in the middle. The seams should be spinning in a clockwise direction and you’ll see a mini pinwheel in the center. Place the diagonal line of the ruler on one of the diagonal seams of the pinwheel. Align the 2 1/8″ marks of the ruler on the center of the pinwheel. Trim the top and side. Rotate the pinwheel half a turn and line up the diagonal line again on the diagonal seam. Align the previously cut edges with the 4 1/4″ line of the ruler. Trim the remaining two sides. 10. Make four pinwheels that are 4 1/4″ square. Note: These are made using the same technique and dimensions as the pinwheel blocks, with the addition of stitch and flip triangle corners. Draw a diagonal line in both directions on the green and yellow 6″ squares. Place a blue 6″ square and green 6″ square, right sides together, and stitch 1/4″ on both sides of the diagonal lines. Repeat for the magenta 6″ square and yellow 6″ square. Cut apart on both diagonals and in half horizontally and vertically. Press the HST’s towards the blue and towards the magenta. Trim each HST to 2 1/2″ square. Arrange the HST’s into a pinwheel as shown. Sew them into pairs, nesting the diagonal seams. Sew the pairs together to create the pinwheel, making sure to line up the center diagonal seams. Use the “setting pin” tip just as we did with the pinwheel blocks. TIP: Before you pin and sew the last seam, you can always pinch the center at the 1/4″ seam allowance and check to see if the seams are lined up. Then pin and sew. Sometimes this “pinch test” will save you time and trouble. Press the seams just like you did for the pinwheel blocks. Trim to 4 1/4″ square in the same manner as the pinwheel blocks as well. Mark a diagonal line on each 1 1/2″ white square. Place a white square on all four corners of each pinwheel unit from above. Don’t forget to trim the pinwheels to 4 1/4″ first! (Ask me how I know). TIP: Use a little water soluble glue stick in the corners instead of pins. It keeps the little squares in position and helps with accuracy. TIP: Stitch just to the right side of the marked line. This allows for the fold-over of fabric and the thread in the seam allowance. Trim the seam allowances to 1/4″ and press towards the corners. Check the size of the beach ball block; it should measure 4 1/4″ square. Trim, only if needed. Sew the pinwheel blocks and the beach ball blocks together to form a row. Press toward the pinwheel blocks (they naturally want to go that direction). The row should measure 30 1/2″ wide. You’re making great progress so far! I’ve really enjoyed seeing your progress on Instagram. Make sure to use the hashtag #summerfunqal and tag me @thecraftyquilter. Please leave me a comment if you have any questions. I’m already looking forward to week 3 and making those sunflowers! I too, love your instructions. They are so easy to follow. I’ve never made HST’s this way. I’ve seen a lot of other people do it, but never attempted it. But, on such a small project, I decided to give it a try. I will definitely be making them this way from now on. These are the easiest ones I’ve ever made. I also agree with Kennie. It would be nice if you would consider a wall hanging for the other seasons too. This is turning out soo-o-o-oo cute!!! Thanks for your generosity and sharing your talent!! Thanks Julie for such a FUN project ! Know you are super busy but in your SPARE time (lol) how about whipping up easy hanging patterns for the rest of the seasons? My daughter loves to change out the wall hangings on her office wall. It is the first thing clients see when they walk in and she gets sooooo many great comments. Thanks again for your hard work keeping us all busy !! My job has me working weekends, so it’s so hard to wait for a day off to work on this quilt, but I got my row done today. And thank you for the tip to use glue! There is a gal in my guild who is always advocating the use of glue, but I never think of it. This truly made things spool much easier! Thank you! Your instructions are great and very detailed! I have one more triangle to sew and then week one is done! I had my sister visiting from Texas ( we haven’t seen each other in 10 years) and I was given a huge surprise 70th birthday, so I am recuperating from all the joy! Monica, I am sorry for your loss. I find joy in quilting with my good friend Jackie, who is also doing Julie’s quilt a long; please know your quilt a long friends are rooting for your well being and offering comfort to you. Thank you Julie for helping all of us in so many ways. I cannot wait each Friday for the lesson. You are a very good teacher in showing the important details to make this come out perfect. Thank you, I just enjoy this so much especially with using nothing but my scraps. So far turning out so cute. Hello Julie; I apologize for commenting so late day wise and time wise! But guess what I did after I printed out the first weeks row of blocks? I set it down and began working on my blocks of HST and center Star block for a quilt ( California King sized) I am making for my Daughters Godmother. I honestly forgot all about it and did not run across it at all the whole week, I think that is amazing in of itself alone. So, when I saw this weeks posts…I just kept looking at it and pondering about it until it finally hit me smack dab in the middle of the eyebrows. DUH…I now have found the first printed section and printed the second set and spent today working on the first row. I found the cutest materials, at least in my opinion. LOL. So, it may take me the remainder of the week to get all caught up but I will. See I am already learning new skills **DO NOT HIDE THE INSTRUCTIONS KEEP THEM UP HIGH WHERE I CAN SEE THEM** I am having fun already. Thank you for putting all of your talents together and creating such a great project! Have a great day! I am very excited about the summer fun quilt along. Although I have been a quilter for many years, the “tips” are a good review, and remind me not to do any short cuts. Thank You. I am enjoying this project so much! You have absolutely, without a doubt, the best, clearest, easy to follow directions ever!!!!! Thanks so much. Thanks. Julie!!!! Fun, fun, fun!!! I plan to add borders to make a little quilt for our local children’s hospital. I haven’t decided just what I may add to the strip in place of the word, SUMMER. I do machine embroidery, so it may be something that I will embroider, or??? ?.